>In selecting the recipients of scholarships, ASSET considers a wide range of factors to obtain a holistic view of the circumstances faced by each applicant. We consider such things as academic performance, educational and career goals as well as personal experiences in dealing with life challenges. All applicants are given a chance to show why they believe they are best qualified to receive assistance and how this assistance will help them meet their stated goals. It is important to note however, that ASSET does not select the recipients of scholarships on the basis of tribe or gender. What we seek to identify are students who are genuinely interested in finishing their studies and whose performance indicates a promise of solid returns on the investment made by ASSET and its partners. In December 2008, ASSET Uganda launched the Bead to Read program. The Bead to Read program sells beautiful paper-beaded necklaces and other jewelry from Uganda to directly benefit the ASSET program. 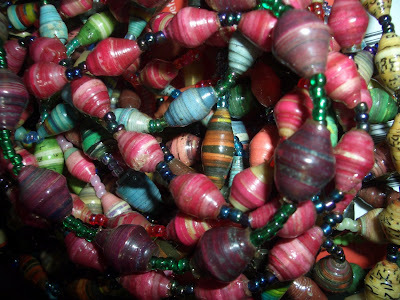 Paper beads are made from recycled magazines and other paper products. All of ASSET’s Bead to Read beads have been hand-made by Ugandan women and men as part of an income-generation project. The beads come in all sorts of colors, sizes, and styles. Many people can’t believe they’re made from recycled paper! Why buy beads from ASSET? When you buy beads from ASSET, you can take comfort in knowing that all proceeds are invested back into ASSET. Thus, your purchase of beads directly supports the education of students in Uganda. In addition, ASSET purchases its beads from low-income Ugandans, many of whom have been displaced by war or are living with HIV/AIDS.